Description: A soft, pale beige, encrusting sponge with conspicuous excurrent channels. Usually irregular in thickness, with a maximum thickness of 10mm. Habitat: Usually on vertical or overhanging rock faces in moderate to strong water movement. Also found in caves. 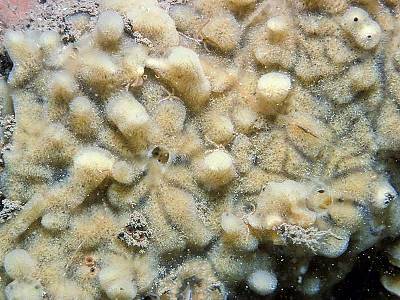 Ecology: Commonly found overgrowing other sponges, especially Stryphnus ponderosus. Distribution: Desmacella annexa was originally described from the Caribbean and is unlikely to be conspecific with specimens from the NE Atlantic. At present the NE Atlantic species appears to be un-named. Picton, B.E. & Morrow, C.C. (2016). Desmacella cf. annexa (Schmidt, 1870). [In] Encyclopedia of Marine Life of Britain and Ireland.